Econet Wireless yesterday commissioned a 466kW solar power plant at its Willowvale industrial complex in the capital, the largest commercial and industrial carport and roof mount installation of its kind to be deployed in the country, signalling easement of the country’s energy challenges. 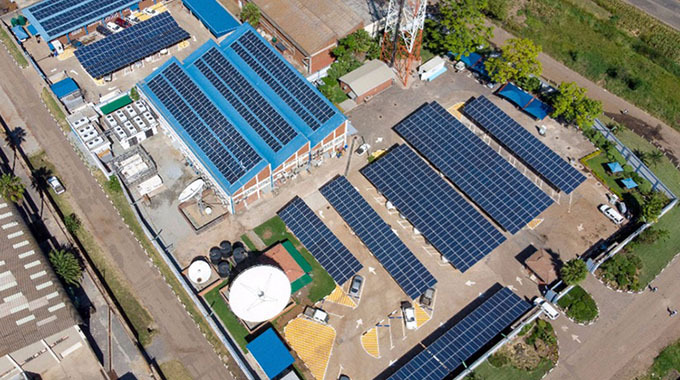 Econet is now saving between 10 percent and 15 percent of its traditional electricity consumption by adopting the use of the grid connected solar system with panels installed on roof tops and car parks of its premises. Distributed Power Africa, a subsidiary of Econet Wireless Zimbabwe, has installed a total capacity of 1MW solar power plants at its six sites. Says Dr Sosten Ziuku, director Energy Conservation and Renewable Energy in the Ministry of Energy and Power Development: “The installed capacity of 1MW has enabled Econet to save between 10 – 15 percent of its electricity consumption. The power plants generate 1.6GWh of energy annually. This translates to a cost saving of $160 000 dollars per annum. Assuming the country’s 100 top electricity heavy using companies, install industrial solar plants at their premises and make energy savings similar to Econet, Zimbabwe could save as much as $16 million dollars a year. The country is currently facing energy supply challenges leading to load shedding and interruption of power supply across the nation. Energy experts say less than a quarter of the population in the rural areas has access to clean energy. They further point out that electricity supplies cannot meet demand as the electricity grid is in a poor state due to inadequate investment in the sector, leading to erratic supplies. As a result, Zimbabwe is forced to import expensive power from its neighbours, mainly South Africa and Mozambique. By December 2018, Zimbabwe’s energy import bill had dropped to about $1,2 million monthly from at least $48 million as the country increased its local electricity generation. For years, Zimbabwe has been grappling to raise adequate foreign currency to pay for its energy imports. Power imports chewed more than $300 million in 2017 piling pressure on the country’s scarce foreign currency reserves. According to official figures, Zimbabwe has an installed capacity of about 2000 MW, of which 58 percent is thermal and 37 percent is hydro, mainly from the Kariba South Power Station. Others such as Bagasse based energy production (Green Fuel, Triangle and Hippo Valley) and a mini hydro generation produce 114 MW mainly for own use and with a balance of 12 MW supplied to the national grid. It is estimated that Zimbabwe has a total demand for electricity of 2029 MW against average available supply of 1200 MW. Most of the country’s generation units are old and inefficient, even though the Government has taken steps to upgrade the plants to increase capacity. A massive campaign to promote the installation of both industrial and domestic solar systems could immediately help the country to make significant savings on energy costs whilst at the same time promoting a cleaner environment. The current rate of traditional electricity supply is exorbitant for most companies and households and it makes most services and products uncompetitive. With an average access to electricity standing at 21 percent in the rural areas and 80 percent in urban areas, the need for alternative energy supplies to meet the energy supply deficit cannot be overemphasized. Zimbabwe has abundant renewable energy resources which are barely exploited and we need to unlock value from this as well as the exploitation of lithium for batteries that can power cars. Access to electricity in both rural and urban areas is still low and the harnessing renewable energy could easily fill this energy gap especially now when Zimbabwe is experiencing rapid urbanisation which is pushing up demand for energy. Zimbabwe is experiencing electricity supply challenges and many users connected to the national electricity grid have had to buy standby generators – either diesel or petrol powered ones which also increase demand for fuel which requires the scarce foreign currency. The recent move by Econet in adopting solar energy at its premises demonstrates its willingness to invest in the improvement of the planet and fight environmental degradation. Government and all other players – private companies, households, mines and other heavy power users should take practical steps to adopt green energy generators. Going green is one of the best options to help with the energy crisis we find ourselves in. Renewable energy collected from renewable resources such as sunlight, waste, wind, water and geothermal heat, are some of the options we can look at as a country. Power shortages, the need to adopt cleaner and efficient systems, SDG targets on energy and our dream to be a middle income economy by 2030 all highlight the importance of adopting renewable energy as a national strategy. What Econet has done will certainly increase the knowledge and confidence of production businesses for this promising renewable energy – solar. Solar solutions to industries and homes have numerous benefits that include – energy savings, no load restriction, secure energy, reliability, pollution free energy almost zero maintenance cost. The use of renewable energy can help accelerate access to energy, particularly for the majority of our people without access to electricity and who are still using traditional biomass which cause much harm to the environment. Use of renewable energy can also reduce vulnerability to supply disruptions and market volatility and it has been shown to have tremendous environmental and health benefits. Zimbabwe’s renewable energy resource base is made up of vast solar energy radiation hydro; municipal solid waste; municipal sewage biogas; agricultural waste and forestry waste. The country has a number of policies that promote the adoption and wider use of renewable energy. And, what is largely lacking is implementation and an aggressive promotion of renewable energy use. Efforts by Econet should be applauded and promoted across all sectors in the country. “With new technology, increased expertise and our viable financing solutions, the adoption of solar energy has increased significantly, and as Zimbabwe is gearing itself towards global competitiveness energy remains a critical pillar in our economic transformation,” says DPA Zimbabwe CEO Divyajeet Mahajan.